If your retail package of the Microsoft Surface includes a Touch Cover, it will come in its own box alongside the Surface itself, both of which are held in a large, box-like sleeve. All you really get as far as extras go is some documentation and an A/C adapter with a proprietary connector for charging. Microsoft went to great lengths to hype up their proprietary magnesium metal alloy, VaporMg, back in June when its upcoming Windows 8 tablets were unveiled. VaporMg was supposed to be a game-changer by being significantly lighter and at the same times stronger than aluminum. 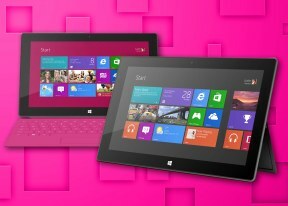 Microsoft has since dropped the VaporMg chassis in favor of a VaporMg surface coating. Whether it's due to poor manufacturer supply, weight issues, or cost, we won't be seeing a full VaporMg chassis on this version Surface. However, we find the coating to be very pleasing to the touch, and resistant (but not immune) to fingerprints, too. It's a major lift for the overall build quality, which is extra solid. 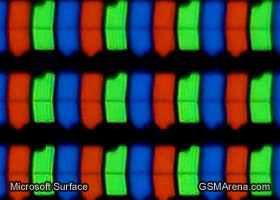 The display of the Surface comes in at 10.6 inches and has a resolution of 1366 x 768 pixels. There's no special display tech to talk about like AMOLED or IPS, but the screen looks good and the resolution is sufficient to display everything with good sharpness. The Surface display can't match the density of the iPad Retina, but it turned out to have better contrast than the Apple-made slate in our test. Above the display there's the front-facing 1.2MP shooter capable of 720p video next to an LED indicator light and a brightness sensor. The included kickstand is also a welcome addition, and despite not being adjustable, always seems to be the right angle for what you're doing. The tab which pops out is thin but doesn't bend when pressure is applied, and the opening mechanism looks like it will last quite a while without issue. When closed, the kickstand sits flush against the back of the device. The bottom of the Surface features the dock area which is connected by some pogo pins. On the top you'll find the power button towards the left side, as well as a pair of miniature grilles that may be speakers. The right side of the device houses most of the connectivity features, with the proprietary power connector, the USB and microHDMI ports, and a speaker grille. The microSD card slot is also located on this side, under the kickstand cover (not pictured). The left side has a volume rocker and a 3.5mm audio port, alongside another speaker grille near the top. The back of the device is bare save for the 1.2MP camera and the kickstand. A nifty little feature of the camera is that it's angled slightly upwards, so that it shoots level with the ground when resting on the kickstand. In-hand, the 680g weight of the Surface feels hefty but not overly so. When used as a tablet, the bezel on either side of the screen gives ample room for holding the device, and if you've flipped the Touch Cover backwards, it provides good grip to prevent slippage. And by the way, under tablet use we mostly mean landscape - the tall device feels a bit awkward in portrait. Plenty of blank space above and below the tiles on the homescreen doesn't look too good either. Overall the VaporMg surface coating, coupled with the design aesthetic, makes the Surface feel like a device worth its price tag. The Touch Cover is perhaps the most poorly-made aspect of the entire package, and the non-physical keys are a drag to work with. But ultimately it's only a huge detriment if you plan on doing extensive typing, in which case the Type Cover will probably provide an acceptable alternative. We have mixed feelings regarding the Touch Cover. It features a full keyboard layout for typing when the kickstand is out, and acts as a screen protector when closed. The typing surface itself is made out of felt-like material, with a subtle rubbery feel to it. It's superbly slip-free, and is lightweight and pleasing enough to the touch. The cover docks with the bottom of the device using a row of magnets, which let you easily snap it to the bottom of the Surface. The magnets are quite powerful and make hitting the dock area a simple task, and secure the cover to the Surface in such a way as to be hard to remove. The bottom side of the cover looks like it's made out of carpet recycled from Microsoft HQ. It may've made nice flooring but we're less than impressed with how it looks on the tablet. The material also appears porous enough (especially the bottom) so it might get stains over time. Typing on the Touch Cover takes a lot of getting used to, especially if you're used to typing on physical keys. The keys themselves provide no resistive feedback, so it's hard to know when you've pressed them. The capacitive touchpad supports two-finger scrolling, but we couldn't detect any others that were recognized by the OS. Keep in mind that scrolling on it works like on a touchscreen rather than a regular touchpad. This means that when you scroll up the screen moves down, rather than in the same direction. We found this to be a little counter-intuitive at first, but we got used to it eventually. You could say that having an integrated keyboard on what is essentially a cover is a bonus, but considering this bonus could run you an extra $100 depending on the variant of Surface you get, it could have been done better. As an alternative, Microsoft offers a Type Cover with physical keys which may address at least some of the issues we had with the Touch Cover. Yet, the Touch Cover has its strong points in the slip-free surface of the keyboard and the fact that typing involves zero noise. Up next, we'll take a look at the software behind the Microsoft Surface.